The man beside me is sir Jeff Benites.He's a person of courage and passion of teaching and in everything that he do.He is my advicer in one subject and in an organization where I belong. He was the one who gave us the chance of making this blog. Even if I find it very difficult I still dare myself to do it because I know I can. I believe that God will never throw a stone that I can't catch. I love pictures ever !... . . I love taking and capturing pictures especially with my friends of different places. From left is Axel next to him is ate Decerie, ma'am Gina is the woman in blue teachers uniform,next is me ,Michael, Shirley then Adrian.We are THE GREAT PURPLE LEARNERS.This was taken during our seminar like reporting.I'm glad that it was successful and thank you classmates for your cooperation. Yeahhh ! bonding time ! ! . .
Crizza ,ate Dilema, Mia,marian, danee,mommy judith, bevs ,becz, me and my bestfriend angie. They are my classmates in morning session.They are nice to be with,happy,cheerful and loveable people. That was taken after our Filipino class. 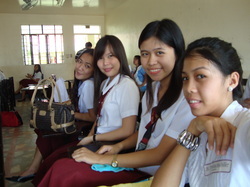 Me and my classmates in Facilitating Human Learning. Learners are more interactive in class discussion when we use technology.Like this picture here ,we took a shot for documentation. He is Kuya Kenneth my partner during the clubday of the first semester. We presented our club shirt for the educators society on stage make some "rampa","pakilala" and my God I felt "kaba-kaba". Unfortunately, we didn't win the title but at least we join and gain some sort of self confidence and experiences.